THE BEST COMMODITY TO HAVE IN AN EMERGENCY IS GOOD HEALTH. Winter has come and gone, and your little survival group has survived the harsh cold. With the promise of warmer temperatures in spring and summer, life is good …or is it? Warm weather brings its own hazards to your health—and I mean more than extended seasons of tornadoes, wildfires and hurricanes. In addition to injuries and illnesses, you’ll have to successfully confront a number of health, hygiene and sanitation issues, all of which can put your group in serious jeopardy. It’s just common sense that the healthier you are when things go south, the more likely you’ll be able to survive the challenges ahead. This means eating healthily, exercising regularly and using today’s technology to correct weaknesses that could spell your doom in tough times. This might include having that loose cartilage in your knee dealt with or having a LASIK procedure to get rid of those thick eyeglasses. Face it: If you’ve got a bum leg or can’t see the broad side of a barn, you won’t last very long in a serious survival situation. One factor you thought wasn’t going to be a health risk when things get warm is, well, the weather. True, hypothermia might not be a daily hazard, but rain, wind and altitude can make temperatures vary widely, especially in the spring. You have to worry about exposure to all sorts of conditions. The wise prepper will always make sure to have rain gear and a change of clothes in their backpack. The key to avoiding problems with exposure to cold or overheating is to be able to add or shed layers as needed. An ounce of protection is worth a pound (no, a ton!) of cure. Preparedness advocates might have large stockpiles of food and other materials. That’s fine for short-term detours off the grid, but a long-term disaster could cause even plentiful supplies to run out. In the long run, staying in place might not be an option. Traveling great distances to reach resources might be required. Native Americans used seasonal relocation to great advantage in olden times. 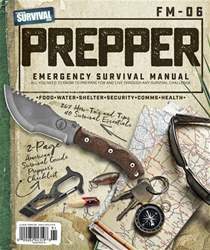 The average prepper, however, hasn’t spent a lifetime barefoot or in moccasins. Foot, hand and even eye protection are rarely considered “survival” medical items, but the problems they prevent can give even the best medic some major headaches. Whether it’s patrolling a perimeter or heading to hunting grounds, special emphasis should be placed on the importance of well-fitted shoes. Let’s see how.